FACTORY78: TINNY ENTERTAINMENT INVITES THE GENERAL PUBLIC & FANS FOR THE #KomijeDanceParty. 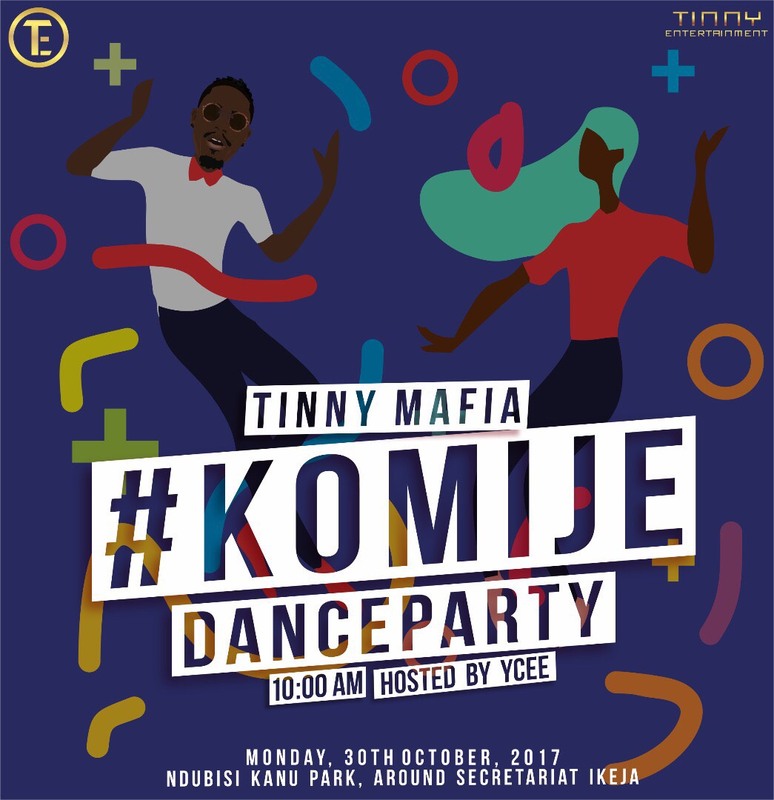 TINNY ENTERTAINMENT INVITES THE GENERAL PUBLIC & FANS FOR THE #KomijeDanceParty. Tinny Entertainment is set to host fans and the general public for it’s exclusive #KomijeDanceParty. In conjunction, Tinny Mafia will be shooting a video for the fans to show appreciation for the love so far. Fans, general public, and all music lovers are invited to come display their Komije skills and also come enjoy & share in the experience. The #KomijeDanceParty will take place at Ndubisi Kanu Park, Secretariat Alausa, Ikeja on Monday, 30th October 2017, starting at 11:00am. After the success of the first video that was shot in the United States, Tinny Mafia and the management team at Tinny Entertainment are not hesitating to follow up with a new video for the hot sparkling single “Komije,” which was released in September and is doing great nationally and internationally. The idea behind #KomijeDanceParty was simple. We wanted to express the kind of love Ycee and Tinny Entertainment has been receiving from all our fans worldwide, firstly by putting out the #KomijeDanceChallenge in which the winner tends to win #350,000 within Nigeria and $1,000 outside the country, and lastly, the #KomijeDanceParty. There’s no doubt that as young as Tinny Entertainment is, we have been doing remarkably well by producing an A-List artist in such a short time period in a market where giants like Mavins, Choc City, EME, and co are dominating. The CEO (Mr. Timilehin Arokodare) popularly known as ‘Tinny’ believes that “we all have a responsibility to give back because no one becomes successful without lots of hard work, support from fans, and a little luck”. He believes giving back creates a virtuous cycle that makes everyone more successful.